Preheat oven to 350 degrees F. Spray a 9 x 13-inch baking pan with cooking spray. In an electric mixer, place cake mix and, with mixer running on low, add water, oil, and eggs. Scrape down sides of the bowl and mix on medium for 2 minutes until all dry ingredients are well combined. Smooth batter into prepared bake pan and bake for 35 to 40 minutes. Remove cake to a cooling rack and immediately poke holes from top to bottom using a wooden spoon handle or chopstick. 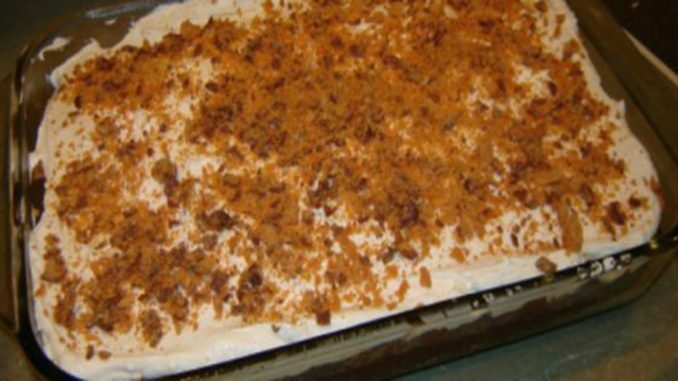 Combine the butterscotch topping with the condensed milk in a bowl and pour over the cake slowly so that it seeps into the holes and permeates the cake. Crush the candy into bits and sprinkle the top of the cake with half of the bits. With an electric mixer on low, mix whipped topping with cream cheese until smooth. Spread on top of the cake and garnish with the remaining crushed candy bits. Cover top lightly with a sheet of waxed paper and chill for 1 hour or overnight before serving.